Its two years since Cymbals Eat Guitars, fronted by songwriter and lead vocalist Joseph D’Agostino, self released their debut album Why There Are Mountains. The record was a distillation of a modern America beyond the boundaries of Brooklyn, lyrically an update on the New York of Roth and Bellow, musically inspired by the likes of Guided By Voices and Pavement, displaying a maturity that belied their comparative youth. The album received a huge amount of critical acclaim on both sides of the Atlantic. The four piece, with D’Agostino on guitar and vocals (displaying the most ferocious primal scream this side of Black Francis), Matt Miller on drums, Brian Hamilton on keys and Matthew Whipple on bass, embarked on a whirlwind of international touring. So they played support to the likes of The Flaming Lips and The Hold Steady and hit up festivals from Lollapolooza and Glastonbury. Finally, come the autumn of 2010, Cymbals Eat Guitars hopped off the touring carousel to start work on their second album. 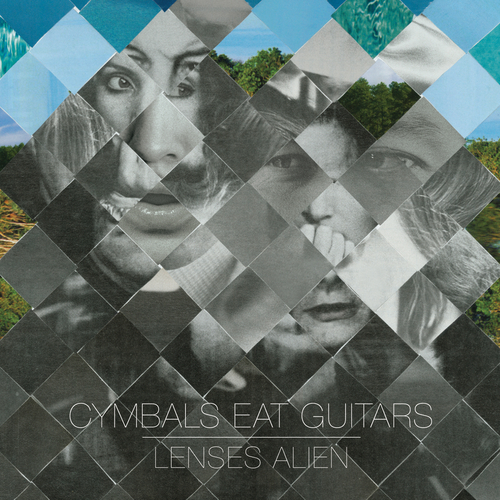 Lenses Alien is a stunning example of a band growing into itself – learning to collaborate, becoming more confident with themselves and each other. Refinement and clarity of purpose came in no small part with the guidance of producer John Agnello, and together they set out to craft an album that re-contextualized the band’s favoured sounds and highlighted underexplored strengths. At its core, Lenses Alien is a marriage of classic pop forms and ambient haze that makes for a stark, dusky psychedelia. D’Agostino’s vocals, now with support from Hamilton and Whipple, sit daringly at the forefront while his lyrics are dark, strange and affecting as ever. Miller and Whipple move the songs as a singular, powerful unit while ornate guitars and Hamilton’s celestial organ and chiming pianos whirl across the sonic landscape. Songs like ‘Definite Darkness’ and ‘Keep Me Waiting’ move with the frenetic urgency of romance that seemingly begins and ends all at once, and ‘Secret Family’ and ‘Wavelengths’ combine Motown-esque turns with impressionistic visions of lost youth and the struggle to retain it. A relentlessly complex listen, Lenses Alien strikes a balance between the archaic and the inviting and is as much a document of doubts and contradictions as of irreverent joy. It’s a varied collection of songs that feels handmade – built from the ground up – and it’s precisely the album Cymbals Eat Guitars was built to make.